Why Water and Milk Drops? Why would a nature photographer be doing water and milk drops in the studio? A fair question, and I'd like to answer beyond the obvious "I'm stuck inside recuperating, and this is the only photography I could do." While I don't plan on making this sort of photography my main focus, I do view these images as a natural extension of my body of work, rather than a side-line or departure from it. This work is an excellent way to graphically depict some of the amazing properties of water. This fits perfectly with Whimbrel Nature's mission of educating about science and the natural world through imagery. We really never stop to appreciate what an amazing substance water is and how its properties are so crucial to life on this planet. So bear with me as I discuss a little bit of the science behind the properties of water and how those properties relate to the anatomy of droplets and splashes. I'll focus on water, but keep in mind that milk is approximately 88% water. At the end of the article, I'll include a little how-to that explains the relatively cheap and quick technique (there are other more complicated and expensive ways to do it out there; search the web) I used to obtain these images, in case you'd like to try it yourself. Still there? I know some folks tend to run screaming at the mention of chemistry (thanks to some truly dreadful chemistry teachers I used to be right on your heels), but a brief overview of the chemistry of water is necessary to fully understand the importance of water's properties to the biological world. A water molecule is made up of three atoms, one oxygen atom and two hydrogen atoms. Each atom is composed of a collection of particles known as protons, neutrons, and electrons. Protons and neutrons are located in the nucleus of the atoms and electrons occur outside the nucleus. Each hydrogen atom has one proton (positively charged particle) in its nucleus and one electron (negatively charged particle). An oxygen atom has eight protons in its nucleus and eight electrons outside the nucleus (two in the first energy level and six in the next). The oxygen and hydrogen in a water molecule form what is known as a covalent bond. The hydrogen molecules each share their one electron with oxygen and in turn, oxygen shares one electron with each hydrogen atom. This allows the hydrogen to achieve a more stable outer electron configuration of two and the oxygen atom to achieve a more stable outer electron configuration of eight. However, they don't share these electrons evenly. This is known as a polar covalent bond. Oxygen, with all those positively charged protons in its nucleus, pulls harder on its outer (negatively charged) electrons (opposites attract right? ), than the hydrogen does. This property of an atom is known as electronegativity and is determined by the proton force in the nucleus and the amount of "shielding" (other electrons and distance) between the nucleus and the outer electrons. So in essence, oxygen hogs the shared electrons and they spend more time closer to the oxygen than to the hydrogen. So the oxygen has slightly more negative charge floating around it than it used to, and hydrogen has slightly less, but each still has the same amount of positively charged protons in their nuclei. That positive proton charge used to balance out the negatively charged electrons in each atom, but now the hydrogen has slightly less negative charge around it and the oxygen has slightly more. So the hydrogens develop a slight positive charge on the side of the atom away from the oxygen and the oxygen develops a slight negative charge on the side away from the two hydrogen atoms. The molecule is now polar. It has a negatively-charged end (the oxygen side) and a positively-charged end (the side with the two hydrogens). This polarity is what leads to many of the amazing and biologically important properties. The charged ends (negative on the oxygen side and positive on the hydrogens) of water molecules all jumbled together can now be attracted to one another (opposite charges attract again) and form a weak bond known as a "hydrogen bond". The polarity of water and the hydrogen bonding lead to some of the biologically important properties of water. 1. Solid water is less dense than liquid water. Have you ever wondered why your ice cube floats in your water glass? Do you think this is the usual behavior for solid and liquid forms of a substance? Ice floats because of the hydrogen bonds. In liquid water the molecules are floating past one another rapidly and the weak hydrogen bonds are rapidly breaking and reforming, allowing the molecules to get quite close to one another. As you cool the liquid into ice, the molecules slow down and the hydrogen bonds become more stable, thus holding the water molecules apart in a regular lattice. The molecules are now spaced farther apart (less dense), so ice will float on water. Why is this important biologically? Because when a pond or lake freezes in winter, the ice floats on top and provides an insulating layer that prevents/delays the water underneath from freezing. Thus the plants, fish, and other underwater organisms are able to survive in the liquid water under the ice. If ice sank, many ponds and lakes around the world would freeze solid from bottom to top, killing the organisms living in it, and many northern bodies of water probably wouldn't ever completely thaw at all. 2. Water is an extremely good solvent. Because water molecules are polar and have charged ends, they are attracted to and surround other charged molecules and ions, and are able to pull these substances into solution. It is no mistake that our cells and essentially our bodies are sacks of water. The water allows us to store and transport chemicals essential to life and carry out all the important chemical reactions that keep us alive. 3. Water is adhesive. Because of their polar charges, water molecules tend to stick to other polar or charged substances. For an example, look at the way water or blood climbs up the glass walls of a capillary tube against gravity. This same action helps water move from the roots of a plant, up the stem, to the leaves. 4. Water is cohesive. Because of the hydrogen bonding, water molecules tend to stick to other water molecules; i.e. water sticks to itself. This is another reason water can move up a plant, against gravity, from the roots to the leaves. The water molecules above pull more water molecules up behind them. This also leads to the property known as surface tension. While water molecules in the middle of a body of water tend to be pulled by other water molecules on all sides (equaling out the forces), water molecules at the surface are only pulled inward which tends to cause the surface to contract as much as it can and resist outside forces. Cohesion and surface tension are responsible for much of the behavior of water drops and splashes. As you squeeze the dropper, a drop begins to form at the tip of the dropper. This drop stretches out and finally falls when the mass of the drop overcomes the cohesion and surface tension causing it to remain attached to the liquid in the dropper. It starts out then in the raindrop or teardrop shape that is typically depicted, but as the drop falls through the air, the surface tension pulls the walls of the drop inward until it forms a sphere. This sphere shape minimizes the "wall tension" as much as possible. The drop then impacts with the surface of the basin liquid, causing a small initial splash as the energy of the impact allows some liquid to overcome the surface tension and fly off as droplets. As the impact continues the drop carves out a larger crater and the impact raises a larger splash known as the "crown" or "coronet" because of its shape. This wall of water is held together against the force of the impact by the cohesive force of the water molecules. The impact has also cratered the surface of the water or stretched the surface downwards. Some of the energy of the impact is spreading out horizontally in the form of waves, but much of it is held in by the force of the surface tension and contained in the downward force of the crater. As the impact force dissipates, the surface tension snaps back, causing a "jet" or "column" to form. Sometimes the jet or column will have enough energy to throw off a droplet upward just before it collapses. Here you can see one beginning to form. If a second drop falls soon after the first, the falling drop can collide with the jet from the previous drop. You can see that about to happen here. And here is the result. The sheet of water or milk is caused by the surface tension and cohesion holding against the energy of the impact. At the edges you can see droplets that have enough energy to escape the pull of cohesion. For a great high-speed video of the entire sequence, check out this water droplet clip from the Discovery show Time Warp. You can certainly invest in or build a lot of equipment to make water and milk drop images. There are rigs to perfectly time the sequence of drops and even coordinate that sequence with the firing of your flashes. You can invest in large flash set-ups that sync with your camera and/or drop equipment. 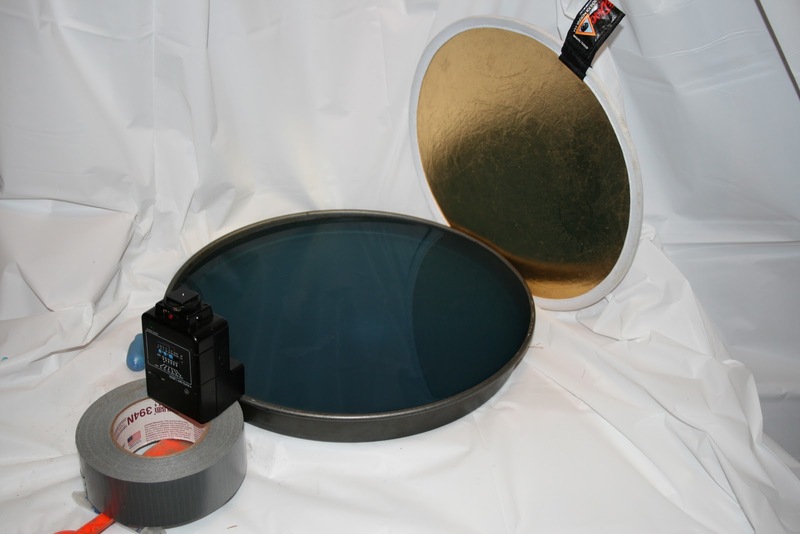 You can buy or build photo or sound sensors to fire the flashes at the appropriate moment. However, since droplet photography was never going to be my mainstay, I was looking for a way to produce droplet images with the equipment I had on hand, without great expense, and without having to drive around (I still can't drive yet) to get specialized equipment or supplies. Can you get better and more reliable results with better equipment? Absolutely! My method requires a lot of trial-and-error, patience, and generally prevents you from getting a lot of the complex forms that some photographers get with perfectly timed equipment. But you can still make some great images! I used the legs of the inverted table as a support for the (hoe) cross-beam that held the syringe in place. I used plenty of duct tape to try to keep the syringe from moving as I depressed the plunger. As I said above, I found the syringe much easier to control than a bulb dropper and less issues with air bubbles etc... You can use a variety of containers for the landing basin, but I found the circular pizza pan fit well between the table's struts and allowed me to photograph at the angle I wanted, without including the edges of the pan in the frame. I tried a variety of combinations, but with the relatively low amount of light from my single flash unit, blue water in the basin with milk in the syringe made the most pleasing and visible combination. The color of the basin water just got better and better as I added more drops of milk to it as well. The key to high-speed flash photography is that most camera flash units (particularly older ones) control the amount of light a scene gets by the duration of the flash. If you can get the flash to use a very short duration, say around 50 microseconds or so, you can freeze the action. There are several ways to get that short duration flash. With newer flash units you can set the flash output to 1/32 or 1/64 power. You could also modify the photo sensor circuit on old flashes. But if you are cheap and lazy like me and usually shoot natural light (and thus don't have the nice flash gear for your camera yet), you can hold an old-style automatic flash (like the Vivitar 2600 I had left over from my manual days) very close to the water basin and have a reflector on the other side to help bounce light back at the auto sensor and quench the flash very quickly. I found this technique much better than trying to use the on-camera pop-up flash set at 1/32 power (although you can make that work somewhat decently as well). The reflector also helps to bounce some more light back onto the splash and open up the deep shadows on the other side of the flash. At the beginning of any session, first I would do a few test drops and center a large blue dropper bulb where the drops were hitting. Then I'd use magnified Live View on the 7D to manually focus on the front top of the dropper bulb. To make an image (here is where the patience part comes in), I would turn out the lights (for this method it will have to be dark). The camera settings varied somewhat and depended on the liquids I was using, but I generally found that between ISO 800 and 1000 at f/14 to f/16 worked well (even with those apertures it was sometimes difficult to maintain depth of field throughout the splash). The shutter speed was set at eight seconds and I also used the self-timer to give me plenty of time in the darkened room to get into position, prepare, release the drops, and fire the flash. I'd set the self-timer, walk over while the self-timer light was counting down and then put one hand on the syringe and one on the inverted flash unit to fire it manually using the test button. The trick here is getting a feel for the right pressure and timing with the syringe, combined with the right timing to fire the flash with the other hand. Initially it was hard to get anything right, but with practice and feeling a few successes, my percentages went up and I almost always captured something interesting, even if capturing the good double splashes was still a sporadic occurrence (often I'd get a few in a row, over think it, and then lose the timing again for a while). Obviously drawbacks to this method include the patience necessary to get the timing and pressure right on the syringe and the timing right on firing the flash. Especially initially, the percentage of keepers is pretty low. Another drawback is that with a single small flash unit firing for such a short duration, the amount of light available is very low, thus necessitating high ISOs. Cleaning up the images with some sort of noise reduction was mandatory. In my case I tested out the excellent noise reduction available in the Lightroom 4 Beta release. Given the low light, and the somewhat textured surface of the bottom of my landing pan, it was also difficult to get satisfying images of lightly colored water. Ideally I'd have a couple of flash units, all slaved somehow to my on-camera flash or to one unit connected with a sync-cord. 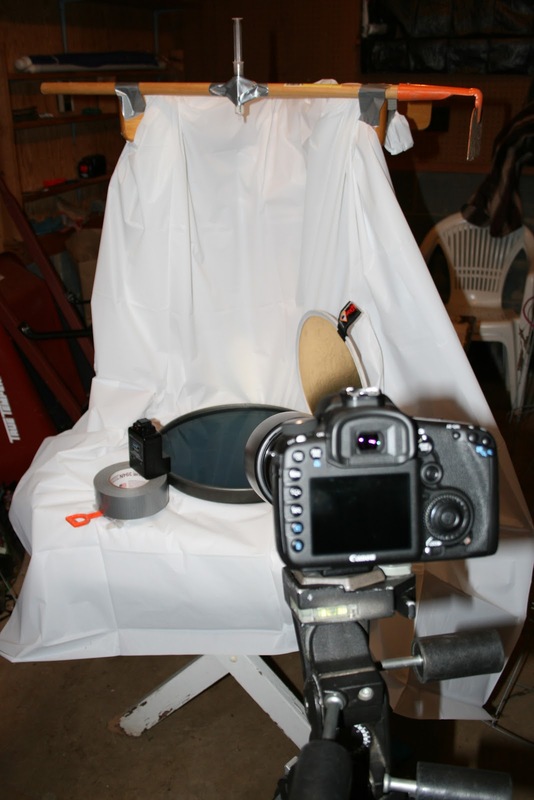 But that was not the gear I had on hand, so this is the method I used. I'm satisfied with the results. Check out this link for a more comprehensive guide to water drop photography, which I consulted while designing my set-up. Questions? Feel free to leave them in the comments section below and I promise I'll answer promptly. Wow Elijah! Great post, AWESOME photos.